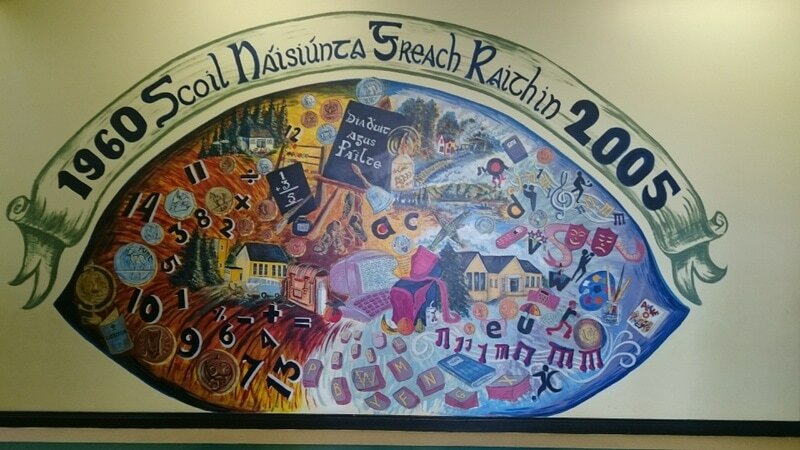 Greaghrahan National School is situated in a quiet rural location midway between Belturbet and Ballyconnell in the parish of Drumlane. Records show that the first school, a one room building was erected at Greaghrahan Cross in 1871. The school had a series of long desks with blackboards on easels at each end. It also had a teacher’s desk and a large map of Ireland. Heating was provided by open fires with the fuel supplied by parents. The children learned English and Irish reading, Spellings, Poetry, History, Geography and Catechism. In 1960, under the direction of Canon Arthur Mc Mahon a new two-room school was built on the present site. The new school was officially opened on 31st of May 1961. The new building was a vast improvement with running water and flushing toilets. In the 1970’s the school was further modernised, with the installation of electric lighting. As a result of the fund raising efforts of parents the yard was re-surfaced and a teachers’ carpark was provided. In 1987, Greaghrahan National School became a three teacher school and a prefab was erected on the site. In 2005, with the assistance of the parent body, local community and Department of Education and Skills, the school was completely refurbished, to include three modern spacious classrooms with toilets, learning support rooms and general purpose room. Outside facilities include two large playing courts for games, a large tarmacadam play area and a spacious green area. In recent years our play area has been further enhanced by the erection by the Parents’ Association, of a trim trail or mini obstacle course to improve the children’s physical development and to promote balance and co-ordination.